It's getting colder outside. Things are changing. Leaves are falling and I'm fitting into my pre- pregnancy jeans!... It is so weird how 17 pounds can make such a big difference in my life. I was outside this afternoon with my dogs and my daughter and one of the dogs ran outside the park and I followed her... and I could run without gasping for air like a fish out of water!!! And my mood has improved a lot too. I feel more energized in general even though I barely eat and I feel like doing so many things without feeling overwhelmed. And the shoes... oh the shoes!!! Now I can use a lot of the pairs that didn't fit me anymore (yes, feet get fat too)... It's such a relief to be comfortable on your own shoes! 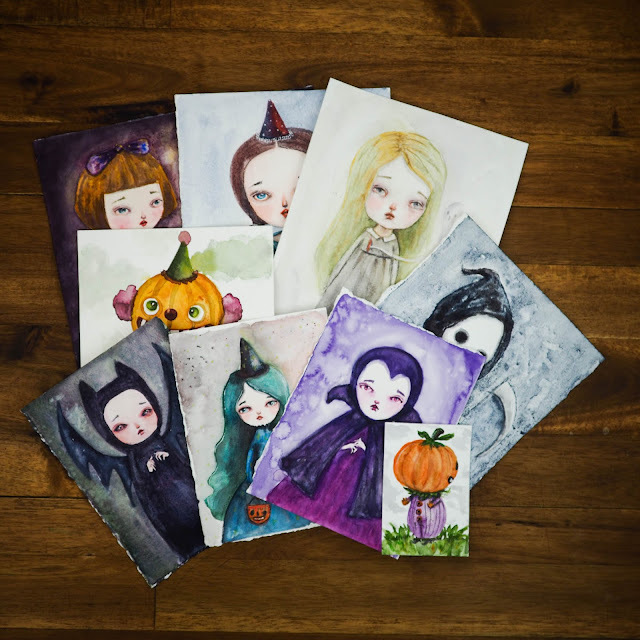 I other news Leah from The Craft Nanny featured me in her blog... thanks a lot Leah! You can see her post here. cute photo! 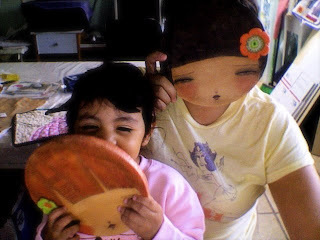 you & your daughter (& your matching danita heads) are adorable! you are doing awesome! you GO GIRL!!! hey~ have u seen the 100 day challenge i'm doing? if not~ stop by & check it out~ i bet u'd dig it! especially now, while ur on a role with your weight! I really like your drawings and your pendants! Wow wow wow... that is such good news, fitting into your pre pregnancy clothes! I am really happy for you, your an inspiration. Just keep plugging away it is a process! But what matters the most is how you feel, but to me your posts have been getting more uplifting as you treck on your journey! KEEP AT IT! PS what a fun picture of you and your little stinker! I love your art! Great faces too. Good job! Keep up the exercise - it's invigorating! It does feel awesome to lose weight and feel the difference in yourself. I've doing the same. ADORABLE faces by the way - are there mirrors on the other side? Keep up the high spirits! Congratulations Danita! I just spent the morning catching up on your adventures. I'm so happy you are going to therapy as part of your weight loss! I think that will make all the difference for you, plus it's always nice to have someone who won't judge you to talk to. Keep up the good work skinny girl! Danita, in my former life (pre-children) I was a personal trainer. It is very common to drop a good deal of weight and then to come to almost a screeching halt. That's when you need to either add a little distance or intensity to your routine. If you ever need some workout tips or help, please feel free to email me. I've trained TONS of people! And they were usually women like you and me....trying to lose the baby weight! I do understand how great you feel! It's a great motivator! Concentrate mostly on how you feel and be suue to eat your protein first! It is hard to go by the scale alone...measure by how many sizes and inches you have lost. That is what I am doing right now...it works for me.